Europe-International Court of Justice-The Hague This is the building which houses this UN institution . Went to the visitors centre and watched a film about the hold complex. The Postmark is not fully formed. But this card was posted at the Special Post Office here. It can not be accessed by the general public. 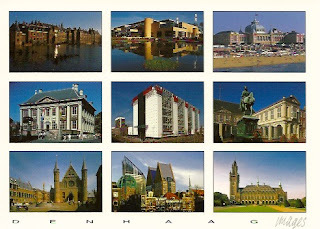 The Stamps I purchase in advance from the Philatelic service of The Netherlands. I purchased these particular stamps as they feature Bonobos which are endangered great Apes. They are not especially large and look like chimpanzees . I was lucky to see these on my trip to DRC. So loved these stamps. Europe-Netherlands-Amsterdam This is a evening scene in Amsterdam. I enjoyed this short winter break . It was cool in the evenings but a very packed city. Amsterdam is very compact and easy to get around. 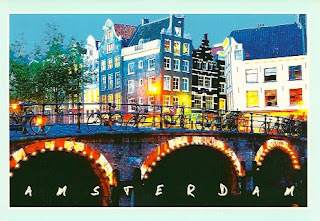 Did a tour on the canals and enjoyed it very much. 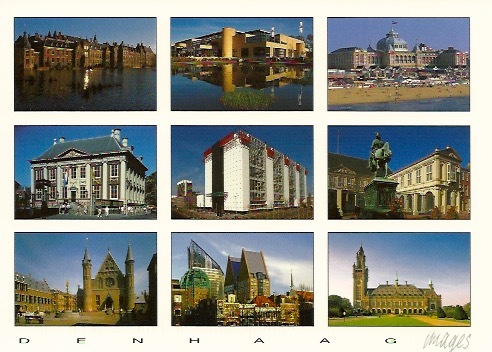 The canals are a World Heritage Site. This card has a double postmark with the final one by the Irish Post Office on incoming mail. 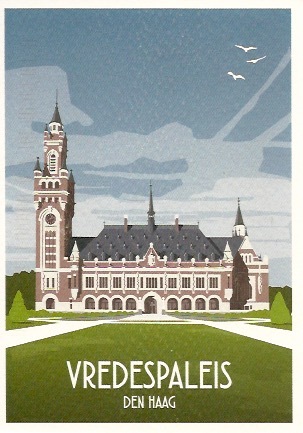 I purchased these stamps from the Philatelic service online in advance of my visit. "Red Star over Russia "
Europe-United Kingdom-England-London This card is from the "Red Star over Russia " exhibition at the Tate in London. 2017 marks the centenary of the October Revolution. 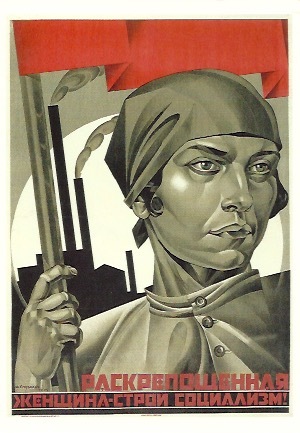 The Exhibition explored the way the USSR was reshaped from 1917. This card is " Emancipated Woman: Build Socialism from 1926. A wonderful gallery to visit. This is the final card with the non postmarked stamps featuring ladybird books. Europe-United Kingdom-England-London This card is from my visit to the Tate London exhibition . 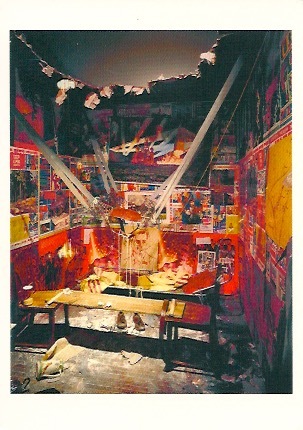 It features a installation by Ilya and Emilia Kabakov widely known as pioneers in installation art. This piece is known as " The Man who flew in Space from his apartment and was originally produced in 1985. It is currently on in London until January 2018. Here are more of the famous Enid Blyton books published by Ladybird. Unfortunately these stamps have no postmark not even a pen mark !! 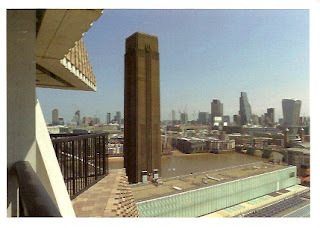 Europe-United Kingdom-England-London This is a view from the Tate Modern gallery in London. Lots of new buildings in this area. These stamps especially remind me of my childhood. There were the first books I read in School and can still remember the joy they brought . So delighted that Enid Blyton had been commemorated in these beautiful stamps. 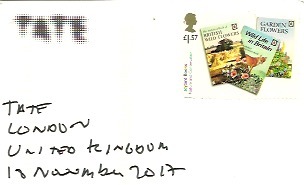 I have often heard of many irate stamp collectors getting mad over the way stamps are ruined by pen by the British Post Office. This the second time this has happened to me. Most of the rest of the time the stamps are not even postmarked. Certainly I can say the British Post Office is the bottom of the pile in this concern.